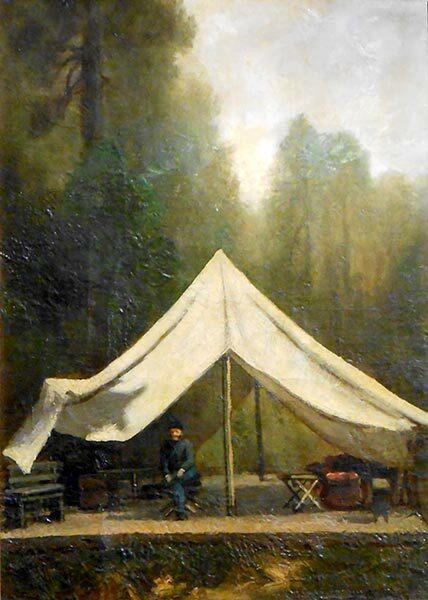 Civil War Soldier in his Tent, oil on panel, 11" x 8" (image), 14.5" x 11.5" framed, signed lower right, old label glued to back of panel reads "R. Blakelock Sketch of my tent made by Lieutenant (Van? )devere and presented to me by the artist. 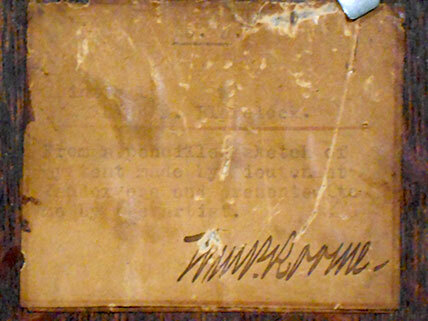 Signature (possibly William Browne ?)" Old "Goldberg Art Shop" label also attached verso. Ralph Blakelock was born in New York City in 1847, the son of a physician. Young Ralph planned initially to pursue his father's calling, entering the Free Academy (later City College) of New York in 1864. By 1865, however, Blakelock had left school and was in Vermont painting with his uncle James Johnson, a self-taught painter in the Hudson River style. In 1869, the young artist headed west. He traveled through California and parts of Central America, living among the Indians and making sketches. He was back in New York in 1876 and, in 1877, married Cora Rebecca Bailey, with whom he had nine children. 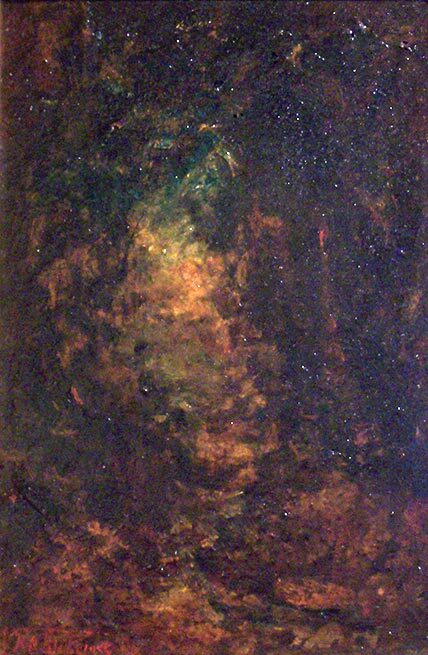 Blakelock suffered from mental instability, which grew worse as he grew older and which was, in all probability, exacerbated by the difficulty he had selling his work and supporting his family. In 1899, he was incarcerated in an asylum in Middletown, New York. He remained institutionalized throughout much of his life but continued to paint prolifically. Upon his incarceration, however, he began to achieve national recognition and, by the second decade of the twentieth century, Blakelock had become recognized as one of America's most original and modern artists. The prices which his paintings garnered escalated to the point where forging Blakelock paintings became something of a cottage industry and where a sordid controversy broke out over custody of the artist and his work. Today, Blakelock's murky, low-light scenes and thickly painted facture rank the artist along with George Inness, Albert Pinkham Ryder, and several others as exemplars of the Tonalist aesthetic. Blakelock's paintings can be viewed in most American art museums, including the Art Institute of Chicago, the Corcoran Gallery of Art, the Albright-Knox Art Gallery, the Metropolitan Museum of Art, the Museum of Fine Arts, Boston, the Museum of the City of New York, the Brooklyn Museum of Art, the National Gallery of Art, the Phillips Collection, and the Sheldon Museum of Art (University of Nebraska).